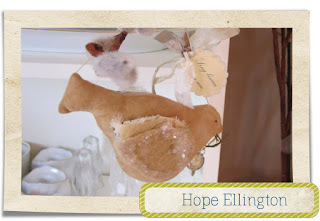 Our instructions were to each to create 8 birds dimensional hanging birds, that were 5-8" long and wide in shabby chic or vintage colors. Alas, back to the drawing board I went! Fortunately, all was not lost. I significantly enlarged the pattern and got back to work. I found some fabrics that I felt were shabby in color (light pink, white, green and blues), and I cut each bird piece out of a different fabric. When they were stitched together I loved what I had! Heaven! 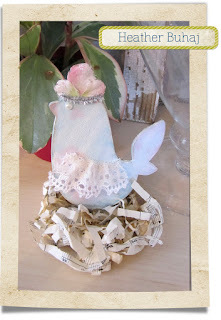 But, I felt like my little bird needed a bit of something... so I added bits of lace to create wings. 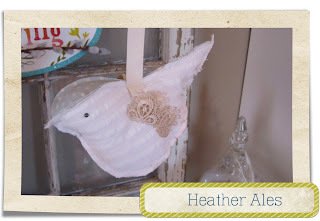 The lace was sprayed with mica mist to give it some bling. I thought about adding a crown to each one, but after cutting out several different ones out of different materials, I decided to leave them without head gear. My birds got packaged up and sent to our hostess, Jennifer. Today, my swap package arrived back from Jennifer complete with everyone elses contributions. It was such fun to look at how each person interpreted the theme and created their birds. Hope included the tag below as part of her packaging. It was SO gorgeous that I had to add it to my spring display! 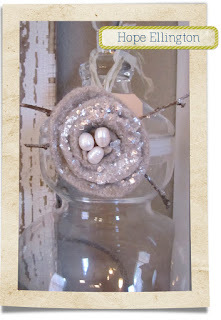 I love the sweet nest with mica sprinkled (kind of like morning dew!) and the sweet pearl "eggs" tucked into the nest. It's SO sweet! Thanks Hope! 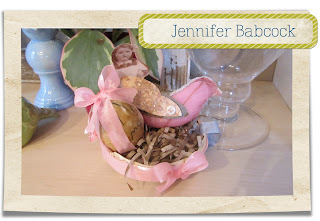 Jennifer, thanks for hostessing this fun swap! In the past, it's been widely known that I plan our menu's a month in advance. Rather, I used to plan our menu's a month in advance. Currently, I plan out our menu's weekly or bi-weekly. Monthly planning worked out BRILLIANTLY for us when I was working. I always had the ingredients on hand to make what we had planned out, and it saved us boo-kooz of money. However, now that I'm home all the time, I find the need to get out of the house. While I do spend the majority of our "escape" time at local parks, sometimes going to the grocery store fills the need. In my menu planning experience, I've realized two important things. It's important to plan "leftover" meals, if your family isn't large (mine is small), and if what you're making is more than your family can healthfully consume in one sitting. Scheduling the "leftover" night, eliminates the need to buy additional groceries/ingredients for another meal, and keeps things moving along in my fridge. (Rather than sitting there rotting away because I forgot it was there, or what have you.) Another option, if it works with your meal, is to freeze it and save it for later. So, there are plenty of options for all of our eating needs this week. 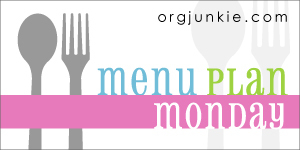 What are you planning to eat/cook this week? I always look forward to my visits with the fabulous women at the Paper Crown in Oklahoma City. It's such an awesome store, and their patrons are positive, creative, and loaded with wonderful attitudes. I've never left, without a smile. It's almost like coming home. 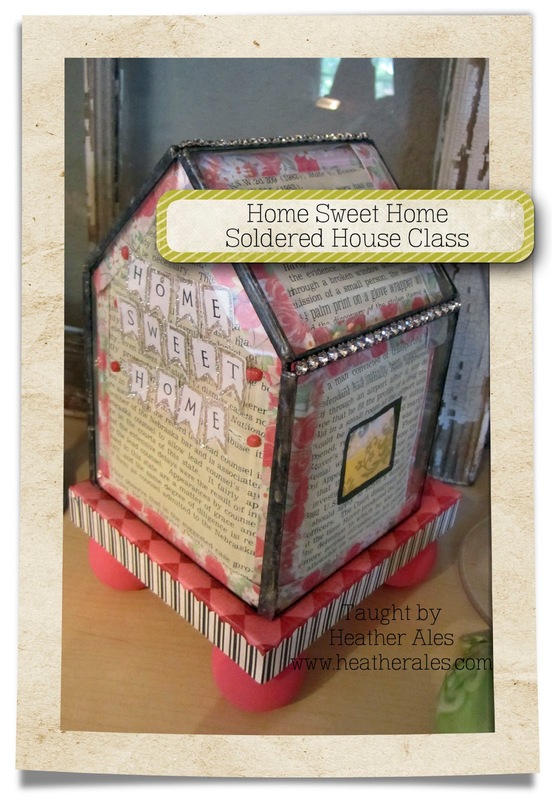 Towards the end of April (April 23rd), I'll be visiting again, and this time teaching a new class - Home Sweet Home! I think you'll agree, it's not your ordinary home! Isn't it sweet?! This project will be completed during our 6 hour class! Yes, SIX hours! It is a lengthy class, but a one hour break has been scheduled in. So, be sure to dress comfy and feel free to bring a lunch (or pop out to eat!). Light snacks and treats will be provided. Each student will need to bring the following supplies with them: paper trimmer, scissors, wet & dry adhesives, pencil, ruler, extra fine black sharpie marker, tile work surface, soldering iron & stand, flux & brush, lead-free solder, sal block, burnishing tool, clamps, and bent nosed hemostats. Each week, my family gets together (or tries to!) and we have an activity. In my family, no activity is the same without a treat of some sort. Granted, the treat can be as simple as a few Skittles, or something equally easy. However, me being the person I am, normally bake something. This week, I wanted to make something sweet, simple and refreshing. Orange Creamsicle Cake. I forgot to take a photo and asked Steve to take the rest with him to work. YOIKES!! Mix cake and bake as directed, adding 1 teaspoon of orange flavoring to the batter. Make orange gelatin, using 1 cup of water (1/2 of what is called for). Poke holes in the hot cake, with the handle of a wooden spoon. Pour gelatin over cake and cool. Mix pudding mix with milk, vanilla, and remaining orange flavoring. Mix the pudding mixture with the whipped topping and spread on your cooled cake. When I started writing about the new things I have been trying out, I didn't realize there were so many of them. I really did think there were just a couple of them. But, there is much more! Now that I'm a stay-at-home mommy, full time, our monthly income has been drastically slashed. That means, my craft and hobby funds have also been drastically slashed. 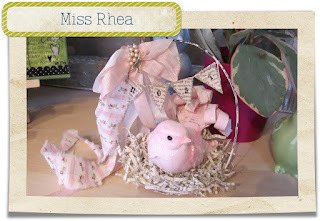 Fortunately, I've been doing quite well with my craft purchase challenge, or lack of them. I have, however, purchased several things to utilize in classes. One of the huge bummers in our budget change, is that I won't be able to attend the art events that I have in the past. Aside from socializing with friends who "get" me, the thing that draws me to art events is learning. I attend to learn techniques and skills that I can take home and apply into other methods for myself. I love being right there with my friends and seeing our instructors create art right in front of us. I love that I can literally see, peering over their shoulder, or in front of them. It's one of my most favorite ways. One of the ways I've been able to meet this need, and yet not leave home, is to participate in online art courses. 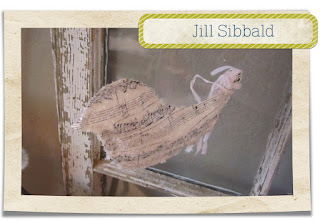 There are some REALLY fabulous classes available online - and they are AWESOME. I've already shared that I took (I'm still working on finishing!) 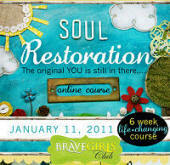 Soul Restoration with the Brave Girls Club (there's another class starting on April 5th). It is the best course I've ever taken for myself (I can't say was, because I have a few things to do before I'm done). It was fun too! Don't get me wrong, it was HARD work. But, it was worth everything I sacrificed to do it. I learned so much about myself and about art. 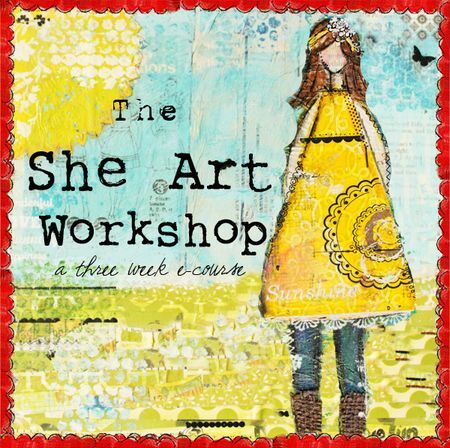 Another class I am taking (smack in the middle of, actually) is the She Art Workshop by Christy Tomlinson of Scarlet Lime. This is probably, the most inclusive art class I've ever taken. I have learned SO much and I've loved every minute of it. Christy really takes you right into her studio, and shows you exactly how she creates. She's created and shared over a dozen video's of her creating, and demonstrating how she gets the effects she does. She shares her techniques, supplies, and methods. 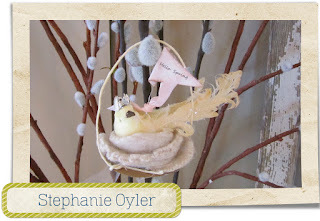 In this class, Christy shares how she creates everything to do with her "girls". I'm talking hair, body, face - everything. I love that she shares technique video's showing you how to create various backgrounds - using what you probably already have in your craft stash (so you know shes not sharing all of this JUST to make a buck - but I will tell you that the prices she has on her site are fantastic. I can't beat her price on canvas's ANYWHERE). I love that through this class, I am putting more of an effort to utilize the mountain of scrapbooking papers and products I already own, rather than feeling pressured to go out and shop for more. There's even a community where you can post questions (which Christy, herself, answers! ), and a Flickr group to share your art with other attendee's. If you're interested in learning Christy's techniques (you will NOT be disapointed! 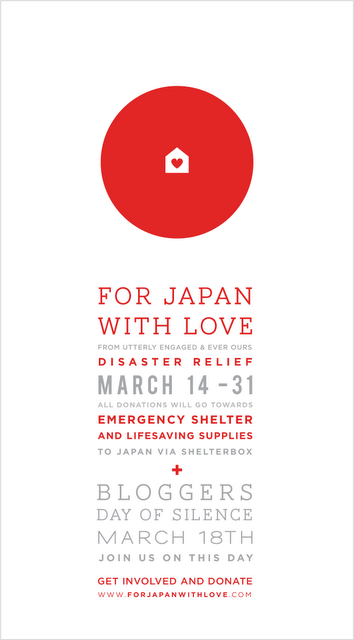 ), she is opening the classroom on April 11th, for additional students. That means that you can join us; have full access to all three weeks worth of classes, join the flickr group, chat in the community, and be able to participate in the class at YOUR OWN PACE!! The classroom is staying open for 3 months, so you'll have plenty of time to enjoy the class, and rewatch the video's (like me!) and enjoy the content! So, check it out! I think you'll love it! I need to take some better photos of my "girls" and share them - soon! I promise! Soon!! On a side note, many of you have asked, so rather than feeding the fire, I wanted to make sure you knew that this will be the first year that I have not attended Silver Bella. I've been to all 5 of the previous events! I have really enjoyed myself in years past, and have REALLY enjoy the friendships I have created over the years through the event. 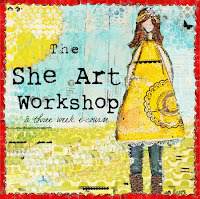 I am, however, planning to attend Art of Spring in June (it's local, and how could I NOT support anything Shea and Debbie do!!) and The Creative Connection Event held in Minneapolis in September. Be sure to visit the event site and sign up for updates! It's going to be an amazing event!! So, I'll be 100% honest. I thought that I would have oodles of time when I became a stay-at-home mom. So much that I really thought my house would be immaculate, the laundry would always be kept up, my son would be incredibly well behaved and calm 100% of the time, I would wake at the same hour I did to get ready for work, but would spend that time being physically active and getting myself ready to start the day with a healthy start. I also thought I would be absolutely bored out of my mind and would spend the majority of my time creating or focusing on civic causes and helping out my community. During the transitional period between no longer being part of the corporate world and moving into being at home with my little man, I created and fed several habits that are proving to be difficult to break. One of them is being attached to my computer. Granted, I was ALWAYS on a computer when I was part of the corporate world (yes, even after hours at home... I was always checking in and working on things from my home). So, when I started staying home, it was part of my natural day to be attached to technology and up to date all of the time. As I mentioned yesterday, I am really working hard on "unplugging". Like... I feel a bit lost, and disconnected. But, in a strange way, I like it. Another thing I am working hard to change, is my level of physical activity. It is important to me that we (his father and I, and as a family) set a good example for him and let him see that we're active. Hanging out at home cleaning, or playing at the park with him isn't setting the example I'd like. It's definitely a fast paced, multi-cultural dance inspired (mostly Latin though), exhilarating workout. If you knew me growing up, you might remember that I was known for my lack of ... grace. I have tripped over invisible things on countless occasions.Completely embarrassing. But, for the most part, I have gotten over my clumsiness. My parents used to tell me that I had natural rythmn. Until... I tried to learn how to line dance. Do you remember a line dance called the Electric Slide? It took me three years to get that one down. I'm not kidding.Three freaking years. And then it wasn't a "cool" dance anymore, and instead was relegated to being a wedding dance. So, though I really do LOVE to dance, I am not very good at it. It's a great thing that Fred doesn't know I am not good at it, because he and I can get our groove on for hours at home. He does his own thing too. I love it! I'm trying new things to make me a better me. Zumba is one of them. And, it HURTS people. My thighs are aching in ways they have never EVER ached in. (Including when my personal trainer - aka Satan's Son - would push me to do things I didn't think were humanly possible. And I ached - oh how I ached - afterwords). I know the pain is good, and that it means my body is doing things it just isn't used to doing - and that THIS IS GOOD for me. But, it's still pain. I love Zumba so much, that I even purchased it for our Wii. I'm working hard to create new habits and trying new (to me) things. Creating healthy and beneficial habits are increasingly important to me. One of the things I'm working on is trying to not be so attached to technology and the internet. This means... keeping off of my smart phone, and off of my computer. It's a whole lot harder than I ever thought it would be. But, I am getting much more done in my home, and that is really more important. I have set several times a day where I sit down and can check things online, and respond to pressing issues. I even remember to set a timer. So, if you find me away from the 'net or taking longer to respond to emails, that's why. I will respond to you though! I promise! It just might take a bit longer than you're used to. 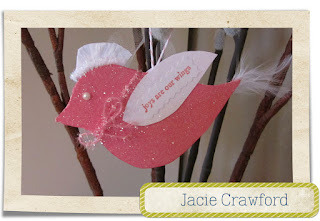 Coming tomorrow is a post about other new things I'm trying out. One of them has quite literally caused me a lot of pain. No joke. Two days later and I'm still in pain.